HARLEM — Calling synthetic marijuana a "scourge" and "poison" that should be eradicated, Mayor Bill de Blasio signed three bills into law Tuesday that ban the sale of the product and give the city more power to shut down stores that deal in it. "Let’s be clear — K2 is a poison. It is a poison that threatens public safety and public health and it’s taken a toll on too many New Yorkers in too many communities already," de Blasio said Tuesday during a press conference at the 25th Precinct in East Harlem. Synthetic marijuana is also referred to as K2. "It’s something we haven’t seen the likes of in the past and it was crucial before this trend got any worse to act decisively," the mayor added. When the three laws take effect in 60 days, selling any product labeled as synthetic marijuana will be a misdemeanor punishable by up to a year in jail, a $5,000 fine and civil penalties of up to $50,000. Previously, the manufacturers of synthetic marijuana would routinely make changes to the chemical composition of the drug to avoid controlled substance laws. The drug is most often sold in bodegas, but a store caught dealing in K2 will now risk revocation of its license to sell tobacco. A first violation can result in the tobacco license being revoked for 30 days and a second violation can lead to permanent revocation under a newly inked law. Stores that sell synthetic marijuana can now be closed under the city's nuisance law, according to the third piece of legislation. 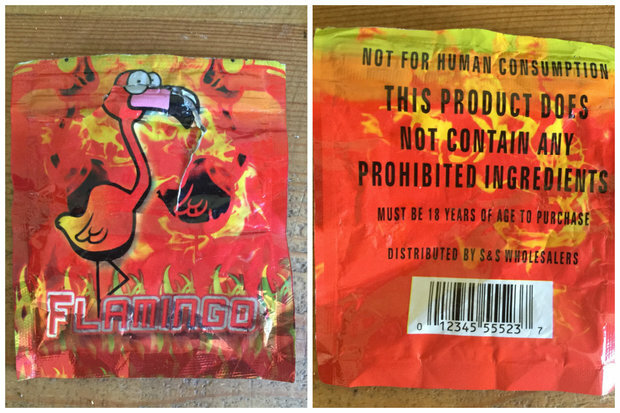 Previously, stores only faced a $250 fine for possessing synthetic marijuana. "It is in fact a very dangerous and unpredictable drug. It is a poison," said City Council Speaker Melissa Mark-Viverito, who sponsored one of the bills. Mark-Viverito represents East Harlem, which has seen dozens of people, mostly around the 125th Street and Lexington Avenue area, hospitalized from using synthetic marijuana. Queens Councilman Ruben Wills and Manhattan Councilman Dan Garodnick sponsored the other pieces of legislation. Health Commissioner Dr. Mary Bassett said there has only been one substantiated death caused by synthetic marijuana in the city. But Health Department data shows there have been 4,500 emergency room visits related to synthetic marijuana from January through September of this year. "You know, people, when they hear the word synthetic marijuana, I think they have an image of somebody in a white lab coat in a lab, making something up according to a protocol. It’s not like that," Bassett said. "The thing you should think of is somebody in a T-shirt in a warehouse, hosing down leaves with some concoction that’s made up of chemicals that they bought on the Internet." Police Commissioner Bill Bratton said most of those chemicals come from China and are used to spray plants with marijuana-like leaves here in the United States. The NYPD is also concerned that the proceeds from the sale of synthetic marijuana might be funding terrorist organizations, based on the millions of dollars that federal agents discovered were being wired to Yemen, where Al-Qaeda of the Arabian Peninsula is based. The NYPD's Deputy Commissioner of Intelligence and Counter-Terrorism John Miller said a critical question about K2 profit is "where the money is going and what’s it going to finance?" In New York City, the Department of Health found that the homeless and the mentally ill make up a disproportionate number of the 4,500 emergency room visits for negative reactions to synthetic marijuana. Both Mark-Viverito and de Blasio said the new laws focus on punishing the seller as opposed to criminalizing the user. "We understand that some of the people who use this drug are amongst the most vulnerable in our city, and often include those who are dealing with mental health issues already," de Blasio said. While possession of K2 is illegal, NYPD Assistant Deputy Commissioner Rob Messner of the Civil Enforcement Unit said those found to be in possession of more than nine packets will be charged with the intent to distribute. Alyssa Aguilera, political director for VOCAL-NY, said she's glad to see that the new laws are not focused on users. Still, she said she believes poor people, minorities and the homeless will ultimately end up being targeted. "The neighborhoods they are focusing on are communities of color and it plays into conceptions of fear that marginalize poor communities," said Aguilera in criticizing the language that has been used in talking about the drug. Both the city and Gov. Andrew Cuomo announced a public awareness campaign about the drug. Aguilera said the public health aspect of combating use of synthetic marijuana should be the focus, similar to the very successful anti-tobacco campaign. "You interweave poverty and homelessness and K2 ends up being another way to beat up on communities that police and our society are already beating up on," she said.